We “Bios Technologies” have gained success in the market by manufacturing a remarkable gamut of Pharmaceutical Tablets, Pharmaceutical Capsules, Pharmaceutical Injections, etc. We are a well-known and reliable company that is incorporated in the year 2010 at Ahmedabad (Gujarat, India). Our offered products are processed in compliance with the pre-defined industry norms and tested to ensure their flawlessness. We are a Sole Proprietorship (Individual) firm that is managed under the supervision of “Mr. Suresh Patel” (Manager), and have gained huge clientele. 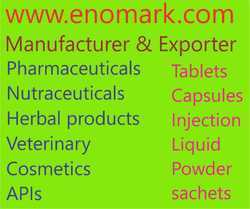 Enomark Biotech India is young and dedicated to developing indigenous resources to produce generic drug formulations in dose form of Tablets, Capsules, Injection, Powder and Liquid. Enomark is WHO-GMP Certified company, Presently exporting to Sri Lanka, Myanmar, Mozambique, Namibia, Kenya, Thailand, Botswana, Africa, Zimbabwe , Mauritius, Nigeria, Ghana, CIS, MEENA, Arabian Countries, semi regulatory and non Regulatory markets. Enomark Group of company also supply & Distribute of generics and branded medicines are manufactured by known Indian and Multinational Pharmaceutical companies i.e Abbott, Ajanta Pharma, Allergen, Alembic, Alkem, Astra-Zeneca, Aventis, Bayer, Bharat Serum, Biocon, Baxter,Bristol-Meyer, Burroughs Welcome, Cadila, Cipla , Celgene, Dabur, Dr. Reddy's, Eisai, Eli Lilly, Emcure, FDC Ltd, Franco-Indian Pharma, German Remedies, GSK, Glenmark, Hetero, Intas Lab, Ipca Laboratories, Johnson & Johnson, Lupin, , Macleods Pharma, MSD, Mylan, Natco, Novartis, Panacea Biotech, Pfizer, Roche, Sanofi Sun Pharma, Torrent, Unichem, Wallace Pharma, Wockhardt, Wyeth, Zydus Cadila. We procured medicine from USFDA, WHO-GMP, GMP Certified Companies. Enomark Biotech India provide best service to Online pharmacy dropshipper, Pharma dropshippers india, Generic medicine dropshipper, Pharmacy dropshipping india, Pharmacy drop shipping services, Pharmacy dropshipping singapore, Pharma dropshipper, Medicine dropshipper in India.